These are genuine Isley Brothers recordings that just don't seem to feature Hendrix. The tracks in question are "The Last Girl", "Looking For A Love", "Simon Says" & "Wild As A Tiger". 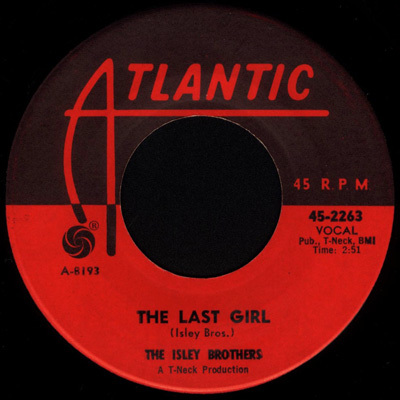 The tracks were originally released on two singles (and later in different mixes on the "In The Beginning" -lp), and recorded in New York during two sessions at times when Jimi was not a member of the Isley Brothers or even in New York City. 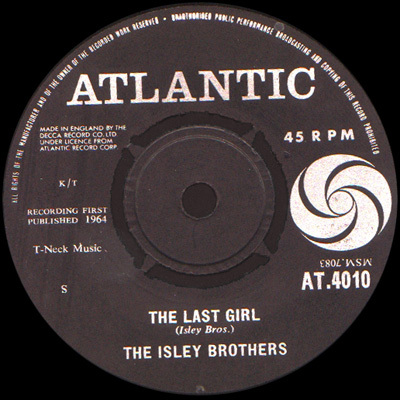 The Isley Brothers recorded "The Last Girl" and "Looking For A Love" at Atlantic Studios in New York City on Wednesday 23 September 1964 3. The US single was reviewed in Cash Box issue 5 December 1964 and Billboard issue 5 December 1964 suggesting a late November release date. The 45 had however been released in the UK already on 30 October 1964 (the date is listed on the labels of a Atlantic UK promo 45). 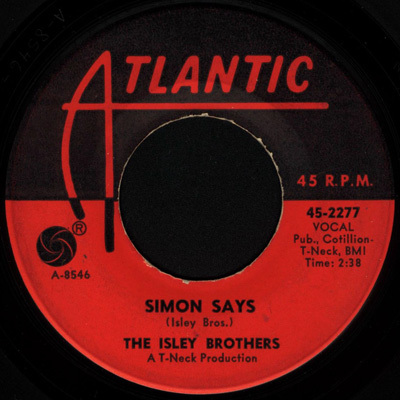 The most likely explanation for this is that as the Isley Brothers were on tour in the UK in October - November 1964 the single was first released in the UK to coincide with the tour and was released in the USA after the tour when the band was back home. 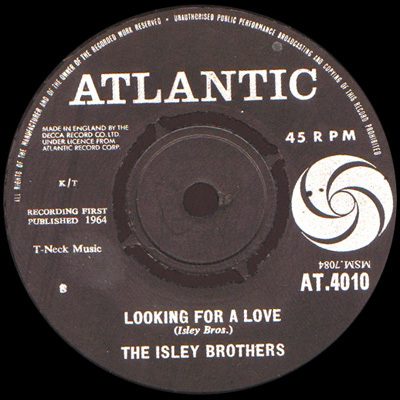 - Yellow label: "Demonstration Sample"
"The Isley Brothers seem sure to grab some spins with this extremely slow-moving, shuffle-beat blues ode about a guy who claims that he`s finally found that very special girl of his dreams. Eye it." "Big sound and emotional dramatic reading. The opus should register well both in the pop and r&b areas. Flip: "Looking for a Love""
"The Isley Bros. should find their way back to the pop charts with this powerful rock take-off on the children`s game. A strong multi-dance beat and a bevy of commercial gimmicks should create excitement with the rock set. The flip side is a fast-paced rocker in the "Shout" vein. Eye this deck carefully." "Wailer based on the kids` game and incorporating all the pop dances. Flip: "Wild as a Tiger""
Exists in at least 3 different versions with stock copy and white label promo copy variations. 1 Reproduced in the book "Jimi Hendrix A Visual Documentary" by Tony Brown. 5 Reproduced in Univibes #17. The date on the postal stamp is impossible to read in the small pic except for "JAN". The date is given as 28 January 1966 in Univibes but the card is clearly from 1965. Caesar Glebbeek of Univibes cleared this up via an email 28 December 2018: "The 1966 year error originates from Al Hendrix, he wrote the year "1966" on the postcard [next to the postal date stamping]. The year is VERY hard to read as that postal stamp ended up stamped slightly over Jimmy's writing. But it is indeed 1965 [the 8 cents for stamps also fit the period]." 6 the US single was reviewed in Cash Box issue 5 December 1964 and Billboard issue 5 December 1964 suggesting a late November release date. The 45 was released in the UK on 30 October 1964 (the date is listed on the labels of an Atlantic UK promo 45).